Conservation day has arrived! The Curl by Clement Meadmore, the large sculpture installed outside Uris Hall, is about to undergo a major conservation project. Those following the Public Outdoor Sculpture at Columbia blog may recall our previous posts about this work, including a video about its history and deteriorating condition over decades of exposure to NYC environmental conditions. In both of those posts we noted that a task force was exploring conservation options for this sculpture, and those plans are now in place. 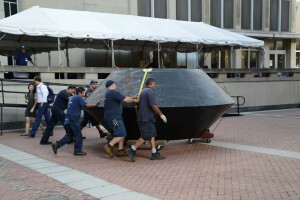 On Tuesday and Wednesday, September 8 and 9, Conservation Solutions and their riggers will dismantle the sculpture, and on Thursday, September 10, the sculpture will be moved off-site so conservation work may begin. The sculpture will be reinstalled later in the fall semester, looking as good as it did when it arrived on campus nearly fifty years ago. 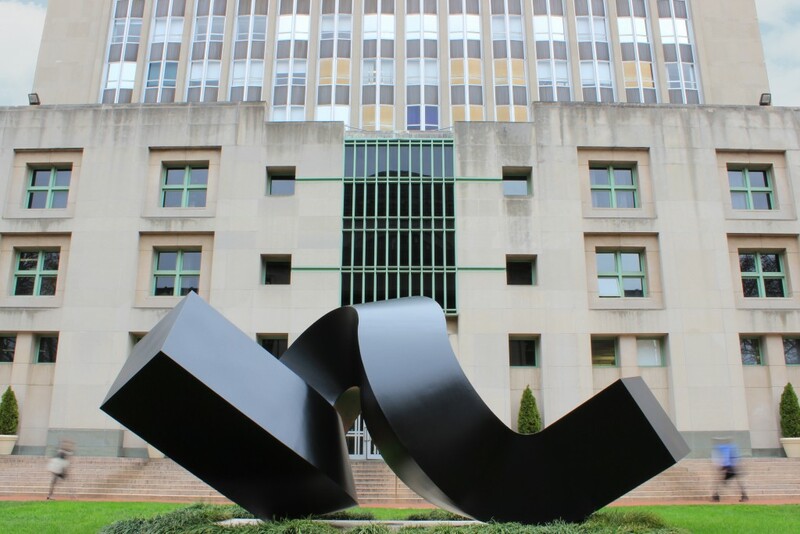 Among the more significant works of public outdoor sculpture on the Morningside Campus, the Curl by Clement Meadmore (1929-2005) was commissioned by Percy Uris (1899-1971), businessman and benefactor of the Columbia Business School. Meadmore received his training as a sculptor in Australia, and in the 1960s emigrated to the United States where he was influenced by Abstract Expressionism, Minimalism, and the improvisational sounds of jazz. 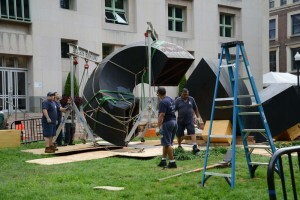 Curl was the artist’s first commission for a large-scale public monument and in 1968 it was installed on the lawn of the new Business School building, which Uris had endowed. 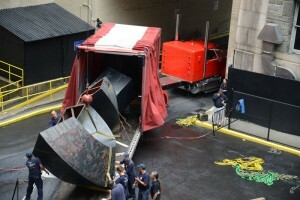 This sculpture made Meadmore’s international reputation, and he went on to receive numerous other commissions for public outdoor sculptures from universities, corporations, and cities around the world. Meadmore began experimenting with Cor-Ten steel, at that time a new product, and he developed his signature fluid-like geometric sculptures that belie the industrial materiality of the metal from which they are made. The inherent nature of Cor-Ten steel is that it rusts, and in the oeuvre of artists such as Richard Serra this rust effect is seen as part of the sculpture’s aesthetic. Meadmore’s interest in painting his steel structures, however, gave them a more pure and streamlined appearance. Unfortunately, over time, the degradation of the paint in combination with the oxidating steel resulted in a number of structural issues. When the Curl conservation project is completed, the revitalized sculpture’s fissures and gaps will be repaired, the rust will have been removed, and a fresh uniform coat of paint will restore the beauty of this work similar to its origins as Meadmore intended. Acknowledgments are due to everyone who has worked on bringing this project forward, including the Office of the Provost, the Meadmore conservation task force, the Columbia Business School, Columbia Facilities, and the Columbia University Libraries. This entry was posted in Morningside and tagged AP photos, Clement Meadmore, conservation, Curl on September 8, 2015 by Roberto Ferrari. 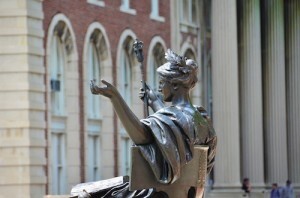 The image you see here was published a few months ago on the BWOG, Columbia’s student-run campus news site. 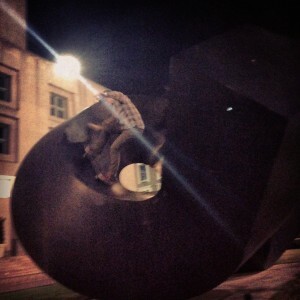 Although the caption suggests that their editorial group appreciated the skateboarder’s midnight riding skills (“color us impressed”), in fact this kind of activity on a public outdoor sculpture is one of the worst things that can happen to the work of art itself. Sculptures in stone and metal naturally suffer from the elements of nature, from acid rain to guano, but they also suffer a great deal from the acts of humans. This ranges from the unconscious touching of sculptures, leaving oil residue that erodes the surface, or outright vandalism and abuse of the works of art themselves. 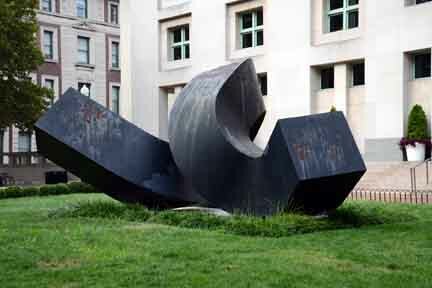 Skateboarding on Clement Meadmore’s Curl clearly is an example of this latter abuse. This sculpture has been interpreted as many things, but the one thing that can be confirmed is that it is NOT a skateboard ramp! 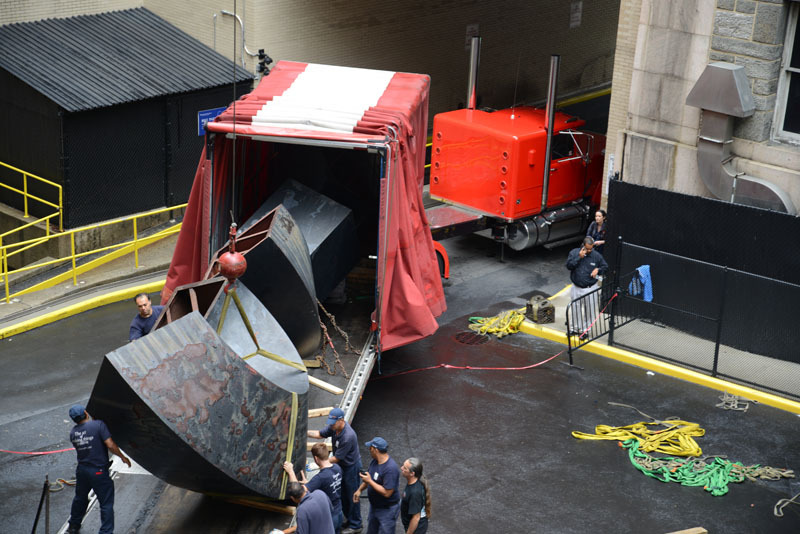 This abstract sculpture was the first commission for a public outdoor monumental sculpture that Clement Meadmore (1929-2005) received. Born in Australia, where he received his artistic training, Meadmore emigrated to the United States where he was influenced by Abstract Expressionism, Minimalism, and the improvisational sounds of jazz music. He began experimenting with Cor-Ten steel, and developed his signature fluid geometric sculptures that belie the industrial materiality of the metal with which they are made. Meadmore received this commission from businessman and philanthropist Percy Uris in 1967. 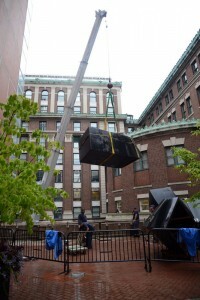 The sculpture was installed at the Morningside Campus a year later as a gift from Uris to decorate the lawn of the new Business School building, which he had endowed. 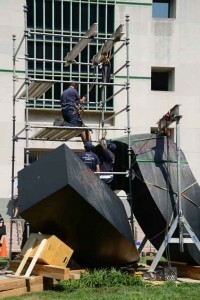 This sculpture made Meadmore’s international reputation, and he went on to receive numerous other commissions for public outdoor sculptures from universities, businesses, and cities around the world. The natural degradation of the paint on the Cor-Ten steel has, unfortunately, made the Curl look less desirable today as it once did. 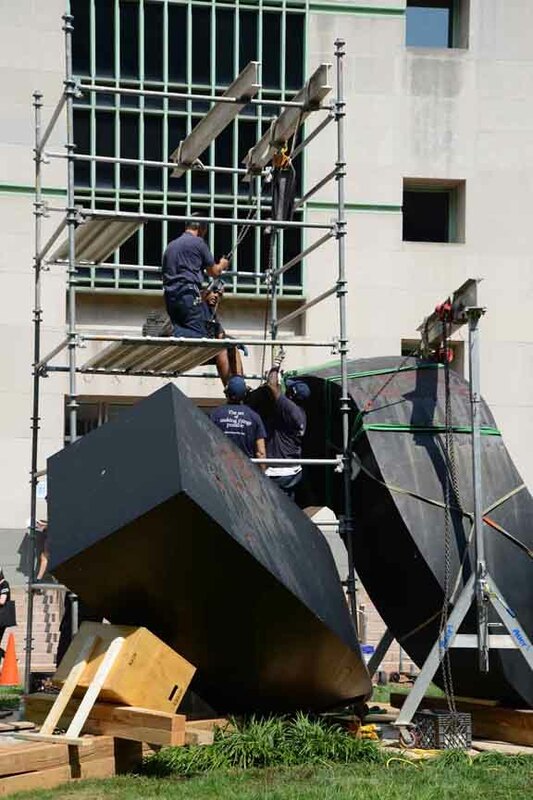 However, a Task Force has been formed to address the concerns of this sculpture and to make recommendations for ways in which Meadmore’s first major work of art can be properly preserved and restored to its original glory. Stay tuned for more information about this. And, as a reminder, please don’t ride skateboards on the sculpture! This entry was posted in Morningside and tagged Clement Meadmore, conservation, Curl, public photos on June 3, 2014 by Roberto Ferrari.